Enjoy Brushing with your Child! Give your baby's first teeth the tender care they deserve with the Brilliant Baby Toothbrush, Stage 5 in the Baby Buddy Oral Care Program. Introducing the world's first and best toothbrush with all-around bristles co-developed with Osaka University Dental Clinic. 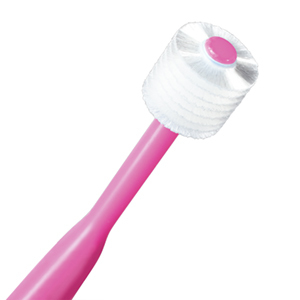 Created especially for delicate young smiles, the Brilliant's soft, ultra-fine bristles allow you to clean your child's teeth gently while massaging gums with a soothing touch. Turn brushing teeth with your child into a positive experience after every meal and at bedtime with the Brilliant Baby Toothbrush. Featuring an innovative, easy-to-use design that gives the same great polish no matter which direction you brush; because of its unique design, brushing is always at the ADA recommended 45 degree angle, allowing parents and caretakers to brush teeth, tongue, and gums without needing to twist their wrist. 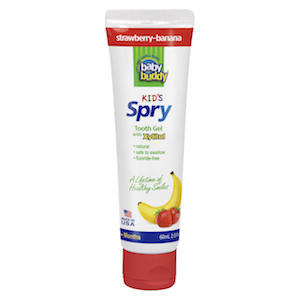 Brilliant thoroughly cleans your baby's teeth, gums, and tongue with Baby Buddy's Spry Tool Gel, toothpaste, or just water. About, 20,000 super ultra-fine bristles, 20x more than flat toothbrushes, remove twice as much plaque and tiny food particles to provide cleaner and whiter teeth. You'll have tons of fun teaching* your baby how to make those pearly whites shine – and that will leave both of you smiling! *Start training after 2 years of age with Brilliant Child Toothbrush. Great with Baby Buddy's Spry Tool Gel. Visit the Spry page to learn more about Spry and the benefits of xylitol. NOTE: Not a toy or a teether! Toothbrushes with bristles should not be chewed or bitten, as chewing and biting may damage or break off bristles. 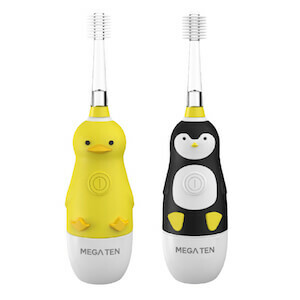 If your child likes chew on a toothbrush, we have just the solution! 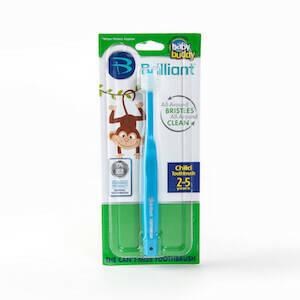 Order Baby's 1st Toothbrush – our chewable toothbrush – today! Tooth brushing is intended to be under adult supervision until 6 years of age. Stage 5 of a complete, 6-Stage Oral Care System, these innovative care products grow with your child from birth to age 12. The first 4 stages are designed to take care of budding baby teeth from the start with state of the art, safe and soft products that children love to chew on. Stages 5 and 6 progress to distinctive toothbrushes for ages 4 months to 6 years that easily clean those hard-to-reach places where food and plaque can build up and cause cavities and other oral problems. 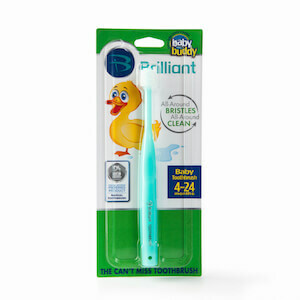 Click on the Videos tab to learn more about Baby Buddy's Brilliant Toothbrush!